NSSF auditor Joseph Hillary makes a presentation during the NSSF Annual Members Meeting yesterday. Photo by Badru Afunadula. KAMPALA–The Uganda National Social Security Fund (NSSF) plans to invest Shs570b in real estate. This was revealed at NSSF Annual Members Meeting 2017 held Thursday night at Serena Hotel. Presenting the organisation’s performance for the financial year 2016/17, NSSF Managing Director, Richard Byarugaba, revealed that they were to put more focus on real estate. Indeed NSSF commissioned a housing project in Lubowa on Monday this week. The project is expected to be complete in the next 3 years. According to the released financial statement for the financial year 2016/17, real estate grew by 7% with a recovery of Nsimbe land Q (UGX 42b). Despite this growth, real estate still remained NSSF’s least earner. It earned 19% from Interest Income, 5% from rental income and 39% from dividend income. 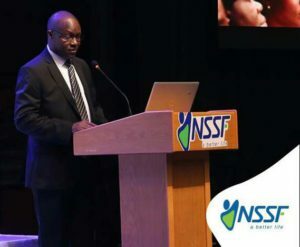 Speaking at the function, NSSF Director Audit, Office of the Auditor General, Joseph Hirya, confirmed the fund had achieved what he called a clean report. “In my opinion, the fund has managed to achieve a clean report. I conducted an audit using auditing standards. The financial statements reflect a true and fair view of the fund as end of June 2017,” Hirya said. The fund registered 149,538 members in 2016/17, which is a 9% growth rate. However, despite the good performance, the fund wasn’t spared by ailing economic environment that greatly affected many organisations, according to Byarugaba. “Our compliance levels have now improved to 84% from 77% the previous year. 98% (Shs766b) are invested assests. Funding allocated to fixed income assists increased by 21%,” Byarugaba said. “Equities grew by 16%. We increased our share holding in companies like UMEME, TBB (Trade Dev’t Bank) and Stanbic,” he added. The year saw them spend Shs131b on taxes while Shs681 billion was spent on interest rate. Among the fund’s plans this year include laying a strong financial foundation. Reacting to the report, NSSF Board Chairman, Patrick Kaberenge said in the whole of the East African Region, NSSF is unrivaled in the social security sector. ” We assure members that we shall continue to protect their money from inflation and also pay good returns. We commissioned the construction of houses in Lubowa which will be accessed through the bank,” Kaberenge said.